Connections of My Kiwi Mate have high hopes for their charge when he continues his return from injury at Tabcorp Park, Melton on Saturday night. The seven-year-old is set to race in The Gammalite, a $20,000 2240M pace for those classified M2 to M4, and horseman Craig Demmler, who will take reins, is hoping he can build on his last start. My Kiwi mate finished a close-up fourth to Love Ina Chevy at Melton on 24th August in his first run back and Demmler was pleased with that run. "We found he had a chip in (the back fetlock) so had to have an operation," Demmler said. "He had a little bit of bone damage, so we have to give that a bit of time to settle down and we took our time bringing him up and getting lot of long, strong work into him. "I was rapt (with his first-up run), especially at Melton where you have to come around wide and make up that ground; on the clock he went super and his work has been really good since. I think he should only get better." 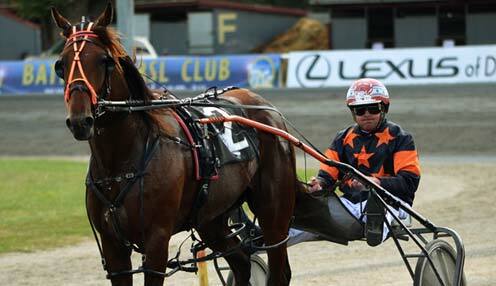 Demmler has revealed My Kiwi Mate is on the Inter Dominion trail, so improvement is a must. "It's going to get harder - he has got to step up a little bit now. I am pretty lucky to have a horse like him and we have just got to hope that he can take the next step," he said. "He has always been a bit of a bridesmaid; probably one of the chinks in his armour is he can switch off when he hits the front so you have got to time your run a bit. But some of his runs when he has been out chasing have been absolutely sensational." Best price on every horse for all races shown live on ITV Racing. T&Cs apply.